At the time, I was a student athletic trainer with access to a variety of therapeutic tools: ultrasound, electrical stimulation, ice, heat—you name it, I was trying it. All of which provided short term relief, yet none solved the problem. But then I was checked out by the FMS, or Functional Movement Screen, which identified what caused the pain in the first place. My hip and hamstring immobility were causing my pelvic bones to rotate, ultimately causing my spine to pinch on my nerves. With lifestyle changes and specific stretches, I now feel better, move better and conveniently have a more consistent golf swing. So let’s take a closer look at what the Functional Movement Screen (FMS) is and what it could mean for you. The Functional Movement Screen is a tool that’s used to identify weaknesses in some of our everyday movement patterns. At Correct2Compete we use it as injury prevention and performance improvement. It allows us to identify potential causes of pain, and more specifically, gives us a starting point to an individualized program. The screen is comprised of a series of 7 movements: Deep Squat, Hurdle Step, In-Line Lunge, Shoulder Mobility, Active Straight Leg Raise, Trunk Stability Push Up, and Rotary Stability. 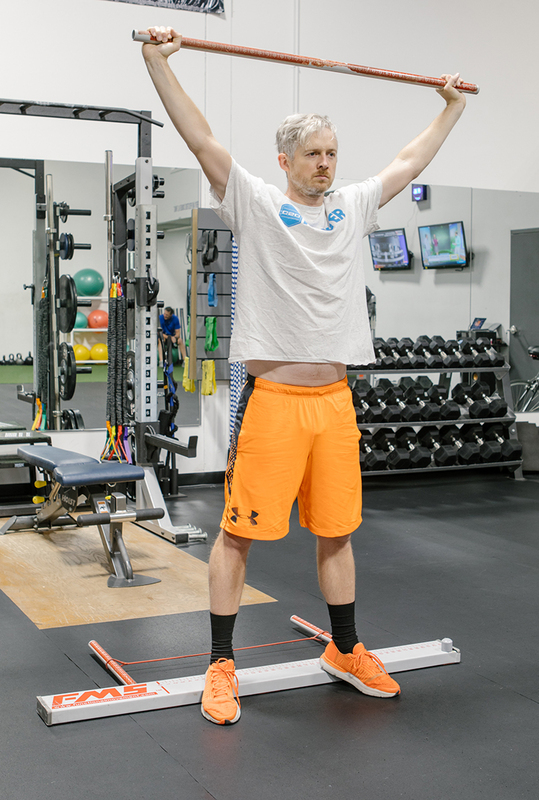 Each of these tests allow for a closer look at how our bodies move, but they also identify limitations that could lead to injury or cause inconsistency in your golf swing. Some of the key things we look for in the FMS are poor hip mobility, poor glute strength, tight hamstrings, shoulder immobility, and lack of upper and lower body separation. Most of these limitations would not be identified unless the individual has pain or a previous injury causing scar tissue. Wouldn’t it be nice to prevent that from happening in the first place? I wish I could have. Surprisingly enough, changes don’t happen overnight. It’s going to take time and dedication. But putting in the work can help improve your mobility. Spending time each day working on soft tissue (muscles, tendons, ligaments) by a massage technique or stretching is one place to start. This could be as simple as rolling a golf ball on the bottom of your foot, or lacrosse ball on your chest muscles. Adding exercises to your routine is another option to increase your range of motion in your spine and shoulder mobility, as well as to strengthen your glutes and hamstrings. This doesn’t mean you need to be deadlifting 200lbs. For the desk workers out there, it can be as simple as laying on the ground and learning to breathe correctly. And of course, working on that posture! If there are movements in the FMS that can’t be performed properly, we can use that insight to identify the swing characteristics you may encounter. For example, lacking movement in controlled positions is going to cause a lot of issues when adding sequencing and power. There is a correlation between early extension, poor hip mobility, and shoulder mobility. Instead of turning your hips to the target, poor hip mobility may result in moving your hips toward the ball instead, causing inconsistency in ball flight. Same goes for a loss of posture and shoulder mobility. This is one of the most common that we see with our members and clients. Lacking the ability to get your shoulders into the external position is going to cause compensation, resulting in a tall stance and bringing your hips forward in the back swing. The majority of golf instructors work around your physical limitations, but this just results in temporary fix, rather than addressing the underlying issue for permanent improvement. To increase your consistency in the golf swing, it usually requires you to take a closer look at what’s really going on. We can help. The FMS allows us to work with a wide variety of people. Whether you’re a youth athlete, scratch golfer, business professional with back pain, or a professional athlete, movement is important. It always will be. Spend some time with our team of professionals and learn how working closely with the FMS can help you with your game. When you have the right tools and insight, you’ll really be able to go after the results you’re looking for.